We provide a wide range of versatile welding and metal fabricating services and custom products to individuals, businesses and governments. 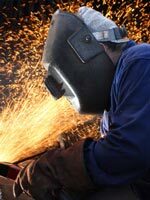 Johnson Welding Works is your source in Ottawa for custom fabrication in all metals and for general welding repairs. Family owned and operated, we offer the specialized personal attention you will only find in a business where the owner is in the store. Well-known for our custom prototyping services, we will build to suit, whether you need only one item or wish us to mass-produce a large quantity. We are now located at 1086 Kilmaurs Side Road in Dunrobin, ON and easily accessible from the Queensway via March Road.